For fans of decent comics set in non-superhero spaces the countdown clock to Marvel revamping their Disney acquired CrossGen library, has seemed like every second counted twice (Florida?). 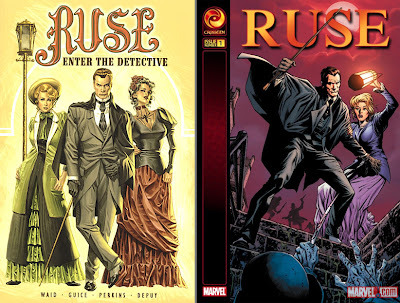 Now set to prove 'this ain't 'yer Granpappy's CrossGen' the House of Ideas has revealed the first two March mini-series to set sail in the mighty Marvel manner - and better yet they are only $2.99 a pop. The biggest realignment with the Marvel style? Sigil. Written by Mike Carey and drawn by Leonard Kirk, the title now shifts it's focus to Samantha Rey. A 16 year old girl from South Carolina, whose inherited destiny from her deceased mother, may give her the power to turn the tide of an inter-galactic time war. Secondly and a little more down-to-earth is Ruse. Non-surprisingly, considering the Sherlock Homes meets supernatural tale was one of the original CrossGen's most acclaimed series'. Now, this fresh coat of paint promises more Simon Archard attitude, as the formidable Emma Bishop sets the world's greatest detective on his greatest case yet. Noted Ruse writer Mark Waid ties the old to the new, and artist Mirco Pierfederici jumps on pencils. Me I can't wait. 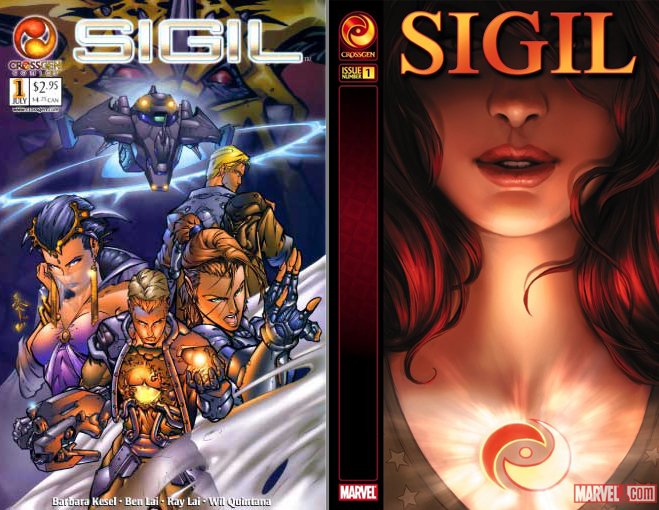 The trade dress is nice and strong, the CrossGen logo more simplified, and in a different turn for comics based on these visuals, the books will also sport the same unifying font set-up for their logos. If this is the amount of thought that's gone into each book - one helluva ride should be instore. Yay! I love Ruse! I can't wait!